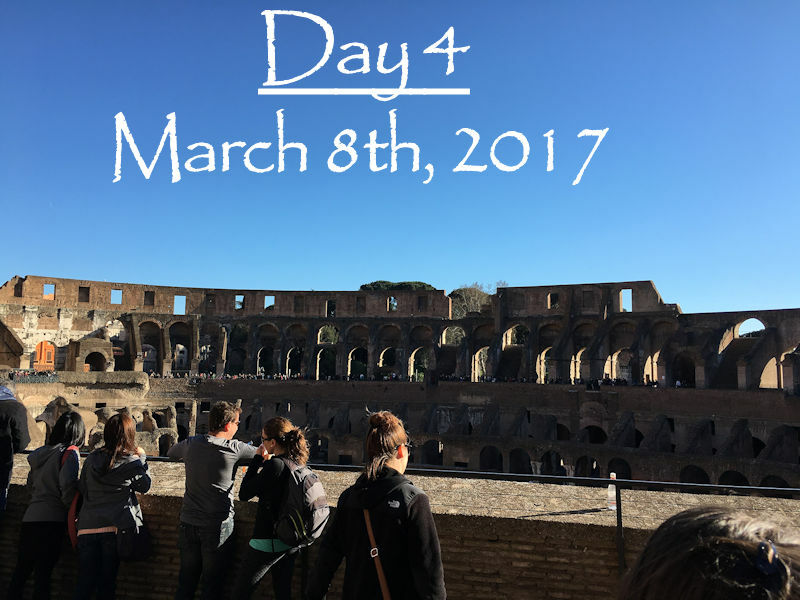 In the blink of an eye, our final day in Rome was upon us. Since Alex and I didn't get to bed until after midnight the previous evening, we actually slept in until 8 a.m. Miraculously, the kids allowed us to do that. I think the busy days were taking their toll on Landon, and he needed the couple extra hours of rest. Our plan for the day was simple. Use our prepaid tickets to tour the Roman Colosseum and Forums and then head back to the apartment for an early evening of packing and family time. Just like the previous morning, the men routed out our directions, which were unbelievably straightforward. Tram to metro. Metro to Colosseum. The six adults and two kids walked out the door right before 10:30 and were greeted to a gorgeous day. It was absolutely beautiful; sunny and warm and the sort of weather I longed for throughout the winter in Germany. That was bound to be a good sign. How could such delightful temperatures yield anything negative? We all stood at our tram stop and began waiting for the vehicle to appear. Finally, this little old lady told my mother in-law in her best English that the city workers were on strike that day. Well, guess that means things will be running a bit slower than usual. After thirty minutes, a tram showed up, and we all hopped on board. It was after 11 o'clock, but nobody was stressing. The metro would dump us right outside the Colosseum, and nobody had any intentions of staying inside for an extended length of time. We still had plenty of time to sight-see, grab a lunch near the sight, and then head back home. The tram stopped at the end of its route, and we all exited. Walked to the stairs leading down to the metro station. And saw the gates closed with chains around the bars. That's when all our light bulbs clicked. A strike meant no running metros. No metro meant bare boned buses running. All of which meant we were at a loss as to what to do. None of us had looked up alternative methods to get to the Colosseum. We didn't think we needed to. And, of course, none of us had internet to use to pull up information. We were on our own, which is very rare in this day and age. S. pulled up his downloaded map and saw our destination was only about 1.2 miles away. It was technically within walking distance; however, we were a party consisting of two toddlers, a man who had just had major surgery not 3 months ago, and 5 other adults who'd put in about 22,000 steps every day that week. Walking didn't sound super appealing. Alex and I knew we could manage it. We were completely capable of it, but we'd also spent the past two days toting around a 23 pound weight and a 38 pound weight. The idea of repeating that there AND back wasn't fun. So, some of the adults gathered around a public map of the bus system and tried to figure out how our journey could be accomplished via bus. We had zero clues as to where the nearest station was, nor what number bus to take, or even how long it would take to get there. But we were out of options and needed to get moving. The men thought they had figured it out. Off we went in search of the stop we needed. This took us through a piazza and down two blocks and around a couple corners. The streets were packed that morning because of the strike and also due to it being International Women's Day. You really got a sense of how many people the public transportation system swallowed up when everyone was forced into the same spaces. Eventually, we found a bus stop. Was it the one we were originally looking for? Maybe if this were another family's story the end result would have been different. A bus would have pulled up after five minutes and everyone would have had a smooth rest of their day. But this was my family and if there's one thing that's reliable with me, it's that if I encounter one bump in the road, then I'm driving into an avalanche of misfortune. We all decided to start hoofing it to the Colosseum. Not even a quarter mile in, I yelled "uncle" and said I was going back home with the kids. We were stopped near a busy intersection, and my father in-law tried to get prices for a hop on/hop off bus tour that could get us to our destination. A nice man saw us standing there and gave us his card. He told us about his daughter's restaurant a few streets over and suggested we eat there for lunch. He asked where we were from, and when he heard some of us came from Florida, he became really excited. He holidayed in Fort Lauderdale every year. It was while he was chatting with us that I realized how hungry I was. We headed over to the man's recommendation and some of the group weren't happy with the price of the restaurant. So we walked up and down a few streets in search of another lunch site. So back to the original place. By that point, I had consumed approximately 4 pasta/pizza dishes in a row. I love me some carbs. I eat pretty much all of them. And this was our last day in Rome. I really needed to enjoy the food while I had the chance. My body was revolting. My stomach was screaming at my brain, "If you don't put some veggies and meat in me soon I'm going to rebel! GET ME SOMETHING SUBSTANTIAL!" It killed me a little to do so, but I ordered a rump steak and salad for lunch. The meat was not a good cut in the least, but I was so, so, SO grateful for the red meat and the leafy greens. I ended up giving a fourth of the dish to Alex, who gave me ten or so of his noodles from his carbonara. It was a shame that I couldn't stand any more pasta, because the selections there were delicious. I had a taste of Landon's gnocchi and J. 's risotto, and they were all phenomenal. In my opinion, this was the best food we'd had the whole trip. That being said, I think I was the only one who felt that way. I know my sister in-law liked the restaurant by our apartment best; she thought they had the best gnocchi and veal. And Alex's favorite was the restaurant where he got fettuccine Alfredo. Three people, three different opinions. That was the great thing about traveling with a group; we each walked away with our own pro/con lists. 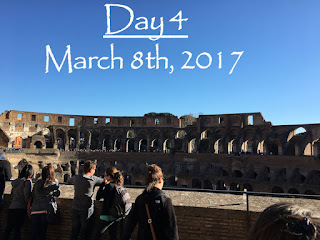 I felt a million times better once I had some real sustenance in my belly, and I was back to being willing to walk to the Colosseum. First, though, we were right next door to Pompeii - the store with the tiramisu - so we NEEDED to go and grab a few more for desserts. They were just as amazing the second time around. Our trek over to the Colosseum took us to the Altare della Patria (the National Monument to Victor Emmanuel II) which housed a monument to the first king of a unified Italy and their Tomb of the Unknown Soldier. And past Trajan's Forum ruins. Everywhere you looked in that part of the city there were ancient landmarks. It was almost inconceivable to imagine how old those ruins were. It made one feel small in the grand scheme of things. At long last, my group arrived at the Roman Colosseum. We waited another twenty minutes in the security and audio guide pickup lines, where we learned that the three females could have gotten in for free since it was International Women's Day. The guides for here were a lot better than the ones at the Vatican, in my opinion. They came on ipod touches (with headphones) and a lanyard to put around your neck. There were small video portions that looked as if they came from an old film, and there were five or six audio selections to choose from. The categories were things like, "Gladiators, architecture, arena, etc." There was also a folder with a map of the Colosseum and certain areas were labeled with a number. If you clicked played the corresponding track, a narrator gave you a short summary of what was in that place. I thought the guide was interesting, and I learned a few things. Landon really liked his, which was the intent. It kept him entertained the entire time. I am probably the wrong person to give a review of the Colosseum, because I wasn't the one who wanted to see it the most. That would have been the guys in my group. It was neat to see up close, and I was glad I got to go inside. Terrible, I know. And I will admit, my opinion was probably a result of the insane circumstances. I was tired, impatient, and maybe a tiny bit bored. Plus, the idea of gladiators and animals and brutal fighting wasn't pleasant. I get that it's history and every era has their share of ugliness, but that doesn't mean I like it. I practically break out in hives thinking about the day Landon asks to join football. (All the head injuries that he could get!) Picturing men hacking away at one another while crowds cheer them on makes me cringe. However, Alex enjoyed the tour and ended up buying a coin to add to his collection. He had to bribe an employee to let him in, though. Apparently, the gift shops close one hour prior to Colosseum closing. Rome needs to get with Disney logic. Keep the stores open AFTER the park closes so everyone shops as they leave. It was the long walk back to the apartment after we finished up at the Colosseum. My mother in-law spotted a Disney store along the way, though, and she insisted we go in for a second. No matter where we are in the world, Alex and I are going to find ourselves around Disney. Back home, I packed our bags (we ended up with an almost an empty suitcase thanks to using most of our baby necessities and food that we brought. It was one of my more successful packing adventures.) and Alex triple checked online that the strike would be over before we needed to get to the airport in the morning. Apparently, it was just a one day event, and we were all good to go the following morning. Dinner for my family was kind of a smorgasbord of leftovers that we'd accumulated throughout the week. A few pizzas, a lot of fruit, some chicken strips, and gelato. Alex and I got the kids in bed and then indulged in some ice cream without them. We lived large in Rome. And just like that, our Italian vacation was complete. I loved the sights, the food, and the family time. I wasn't crazy about the amount of peddlers that were constantly in our face or the hyper awareness I felt I had to turn on when walking around. Was the city kid friendly? Was it inexpensive and easy to find things to occupy oneself? Did I feel it was worth our time and money to visit? Without kids, in a split second. I would just check for strikes every day.